Debone the goose. Cut the goose, all meat, skin and fat into 1 inch cubes. Also cut the pork and pork belly into 1 inch cubes. Heat the goose fat or oil in a heavy pot or large dutch oven; add all the cubed meat and sauté for five minutes. Mix in the onions and continue cooking another ten minutes, stirring often. Pour in the wine and bring to a boil. Add the water and bouqet garni and boil again. Cover the pot and place in the oven. The rillettes must barely simmer for approximately 4 1/2 hours. Stir occasionally. If the mixture boils, reduce oven temperature to 300 degrees. Be sure to keep the pot tightly covered. The meats must cook until they fall apart easily. Remove the pot from the oven and discard the bouquet garni. Take a large meat fork, and, with a back and forth motion, shred the meats. Thoroughly mix the rillettes to blend the meats and liquids. Stir in the salt, pepper, garlic, cinnamon, nutmeg, sherry, cognac, and chopped parsley. Adjust seasonings. 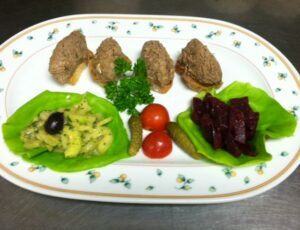 The rillettes must be overseasoned as it will be served cold. Ladle the rillettes into one large or several small ceramic pots. Cool completely, cover, and refrigerate for 24 hours before serving. To Serve: Use as a spread with warm French bread. 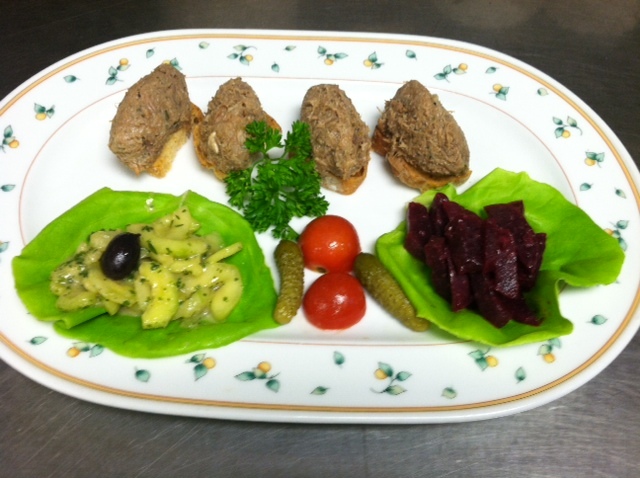 Hint: The rillettes will keep at least two weeks if sealed with lard or rendered fat (goose or duck). Melt the lard or fat and carefully cover the cooked rillettes with 1/4 inch and refrigerate.